Introduction to the VARIABLE VALUE STAMPS or ATMs. Variable value stamos or ATMs form an important part of a collection for any country which issues them. Some collectors resist including them in their philatelic collection, and thus fail to recognise their importance in the mail service. ATMs are as much an issue as any of the definitive or commemorative issues of that country. More and more postal administrations are realising the benefits of issuing ATMs, and the many trials of these issues have proved successful. They will therefore prove to be more and more essential in a stamp collection, as time goes by. The collecting of ATMs issued by the different postal authorities (currently some 60 postal services) can be the reason for an interesting specialized collection. Some issues can be included in topical / thematic collections. Themes are abundant and include famous people, virgins, sports, boats, trains, cars, motorbikes and so on. The most basic would be to collect only one ATM of each model. In this case, a stamp with the minimum possible value that can be printed on the machine. The second level could be the collection of a small value or a complete set of each model and, within the model, of each possible printing variety. The complete set correspond to the basic postal rates used for domestic and the international mail zones. The values which change from time to time with the change of postal tariffs, correspond to the domestic, foreign and overseas rates. More advanced levels of collecting may include varieties of the different generations of machines, printings, papers, control and adjust labels, varieties and receipts, ... Like any other aspect of stamp collecting, you can make it as easy or as complex as you wish. In the case of current Spanish ATMs, collecting has become more difficult because, at the moment, only some models are used in each Post Office, and simultaneously, to each Post office only there is available one printing variety. The situation is not helped as no advance information is given out about machine changes, dates of usage and so on. The collection can be complemented by used ATMs. 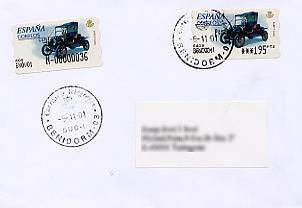 In this case the most common could be to complete the sets with a used cover franked with an ATM showing the national-inland tariff (for example) for each model and each variety. Registered covers are interesting because up to April 2002, besides the franking ATM they have, the most part of times, a control label too with same paper. (Image: Registered letter dated November 6th, 2001. It include the franking ATM (right) and the control label (left). At the present it is necessary to be careful with the conservation and manipulation of current thermal ATMs. The thermal ATMs in Spain. What to collect ? One mint ATM of each different model, preferably one small value in Pesetas. One set for each different ATM issue, face value in Pesetas. One used cover franked with each one of the different ATM issues, in Pesetas. One mint ATM of each different model and printing variety available (6 per model, except models 14 and 19), preferably one small value in Pesetas. One set for each different ATM issue and printing variety available (6 per model, except models 14 and 19), face value in Pesetas. Adjust labels of each ATM issue and printing variety available (4 per model, except models 14 and 19). In Pesetas. Control labels, different types, of each ATM issue. One used cover franked with each one of the different ATM issues and printing varieties available, in Pesetas. Rare or very rare, but the most part of models can be obtained from January 2002 in Euros. Two mint ATMs of each different ATM issue, preferably one small value in Pesetas and Euros. Two mint sets for each model, values in Pesetas and Euros. Two used covers franked with each one of the different ATM issues, in Pesetas and Euros. One mint ATM of each different model and printing variety available (6 per model in Pesetas and 4/5 in Euros), preferably one small or minimum value. One set for each different ATM issue and printing variety available (6 per model in Pesetas and 4/5 in Euros). Adjust labels of each ATM issue and printing variety available (4 per model in Pesetas and 2 in Euros). One used cover franked with each one of the different ATM issues and printing varieties available, in Pesetas and Euros. One mint ATM of each different model, preferably one small or minimum value (0,01 €), only available in Euros. One used cover franked with each one of the different ATM issues, in Euros. One mint ATM of each different model and printing variety available (4/5 per model, except special issues), preferably one small value. One set for each different ATM issue and printing variety available (4/5 per model, except special issues), face value only available in Euros. Adjust labels of each ATM issue and printing variety available (2/3 per model, except special issues). Control labels, different types, of each ATM issue (only available up to model nr. 60). One used cover franked with each one of the different ATM issues and printing varieties available, only in Euros.